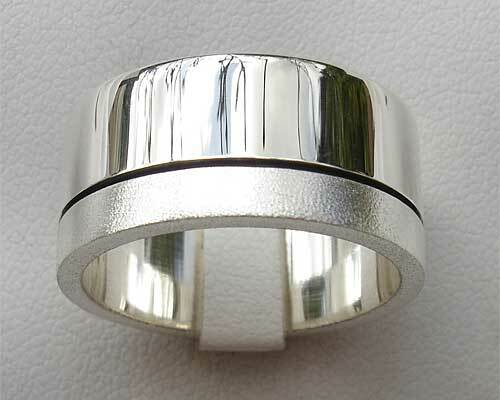 Twin Finish Silver Wedding Ring : LOVE2HAVE in the UK! 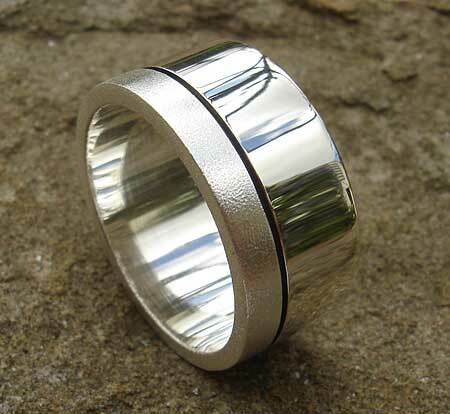 This UK made sterling silver designer wedding ring is one of our wider rings available in two different widths. As pictured, it features a twin finish. One-third of the ring has a matt frosted finish (similar to a sandy texture) while the rest comes in a highly polished smooth surface. The finishes are divided elegantly by a grooved black line, definitely a very classy understated piece for any occasion including weddings. Again you needn't compromise on quality when shopping for budget wedding rings as our rings come made to the highest of standards with this particular one being quite chunky too. Width(s) Available: 8mm or 10mm.